This End-User License Agreement (EULA) constitutes a legal agreement between you (the "User") and iSheetPile (iSP) for use of this website, its applets, source code, or underlying data (together “Website”). By accessing the Website in any form, you agree to the terms and conditions of this EULA. If you don’t agree to this EULA, please do not use this Website. This Website is the property of iSheetPile and is protected by U.S. copyright laws, patent and trademark laws and international copyright treaties, as well as other intellectual property laws and international treaties and conventions. iSheetPile grants the User a nonexclusive, non-transferable license (the "License") to use the Website. The data from this Website may not be downloaded or installed. You may not reverse engineer the Website. All information, data and content obtained from this Website are provided for informational and educational purposes only. This website contains information from both Market Participants (MPs) and Non-Market Participants (NMPs). From time to time, MPs may include additional information as part of their advertising or simply additional technical data for easy of use. Information listed here from NMPs is derived from well-known or publicly available sources. iSheetPile compiles data from industry trade statistics, US customs data, manufactures catalogs, websites and externally distributed installation instructions. iSheetPile undertakes to represent clearly the relationship with each manufacture and invites full and broad participation by all manufacturers and end users. This website is not to be used as an engineering design tool and is not a substitute for professional engineering services. 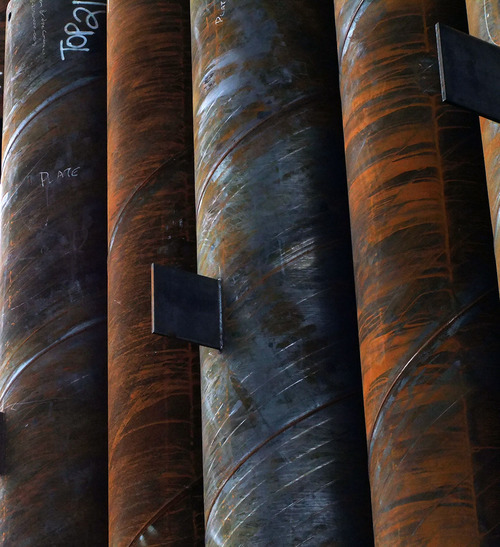 The User must always check with a licensed engineer before making any decisions or taking any actions regarding a steel sheet piling project. The User is responsible to verify the accuracy and completeness of all information provided in this Website. Manufacturer’s data as presented here is only to be used as a general guide. The User must check the normal values established by the specific manufacturer. Any mention of specific brand names does not constitute a recommendation or endorsement by iSheetPile. The authors, development team and iSheetPile have checked the sources believed to be reliable in their efforts to provide appropriate information at the time of release. However, in view of the possibility of changes in manufacturing procedure, human error, and/or different interpretations, neither the authors, nor iSheetPile, nor any other party that has been involved in the development and preparation of this Website warrants that the information and data contained in the Website is accurate, complete or exact in every respect. Neither iSheetPile, nor the authors, nor any other party that has been involved in the development and preparation of this Website program and content shall be liable to the User or to anyone else for any inaccuracy, delay, interruption in service, error or omission, regardless of cause, or for any resulting damages. iSheetPile shall not be liable to the User or anyone else for any direct, indirect, punitive, or consequential damages, including but not limited to, personal injury, lost time, lost of business profits or good will, business interruption arising out of the use, misuse or inability to use the Website, whether in contract, tort, strict liability or otherwise, and whether or not such damages are foreseen or not with respect to any use of the Website. Damages for all lawsuits of whatever kind assessed against iSheetPile arising out of, or relating to use of the Website shall not exceed the total amount the User paid for accessing the Website. The User may not modify, create derivative works based upon, rent, lease, loan, sublicense, timeshare, or distribute the Website or access to it. The User may alert other computer users to the Website. The User acknowledges that the Website contains copyrighted material, patents, trademarks, trade secrets, and other proprietary information of iSheetPile and, accordingly, the User agrees not to modify, disassemble, decompile, reverse engineer, or otherwise try to derive the source code of the Website. The User may not print material from the Website, except for personal use. The User may not remove any copyright notice or proprietary legend from the Website or its output. The User may not use the Website to create tables, files, databases or other compendiums. Use of the Website is at the User’s sole risk. The Website is provided on an "AS IS" and “AS AVAILABLE” basis and without warranty of any kind and iSheetPile expressly disclaims all warranties, including the implied warranties of merchantability and fitness for a particular purpose, warranties as to the accuracy, completeness or timeliness, concerning the information, output results, views and/or functionality (collectively "information and functionality") available or obtained through the use of the Website. iSheetPile does not warrant that the functions contained in the Website will meet User requirements, or that the operation of the Website will be uninterrupted or error-free, or that defects in the Website will be corrected. The entire risk as to the results and performance of the Website is assumed by the User. Furthermore, iSheetPile does not warrant or make any representations regarding the use or the results of the use of the Website in terms of their correctness, accuracy, reliability, currency, or otherwise. No oral or written information or advice given by iSheetPile or iSheetPile's authorized representatives shall create a warranty or increase the scope of this warranty. Should the Website prove defective, you (and not iSheetPile or iSheetPile's authorized representative) assume the entire liability. The User shall never assume that information and functionality is accurate, complete or the most up-to-date information available. iSheetPile shall not be liable to the User or anyone else in any way for any loss, claim or damages caused in whole or in part by Website information and/or functionality. Additional advertising or product support for the Website or its tools may be provided from time to time by iSheetPile under a separate maintenance agreement and clearly identified as such. iSheetPile reserves the right to publish regionalized offerings to suit the end user’s markets. iSheetPile is the sole owner of all title, trademarks and copyrights in and pertaining to the Website product, including but not limited to texts, images, photographs, video, audio, applets, scripts, animations, etc. Any copies thereof are owned by iSheetPile. This EULA does not grant the User any rights in connection with any trademarks or service marks of iSheetPile. All rights not expressly granted are reserved by iSheetPile. This EULA shall be governed by and construed in accordance with the laws of Nevada as applied to agreements entered into and performed entirely within Nevada between Nevada residents. If a court finds any provision of this License to be unenforceable, that provision of the License shall be enforced to the maximum extent permissible to effect the intent of the parties, and the remainder of this EULA shall continue in full force. Without prejudice to any other iSheetPile's rights, this License will terminate immediately without notice from iSheetPile if the User fails to comply with any provision of this License. This EULA constitutes the entire agreement between the parties with respect to the use of the Website, and supersedes all prior or contemporaneous understandings or agreements, written or oral. No amendment to or modification of this License will be binding unless in writing and signed by a duly authorized representative of iSheetPile.